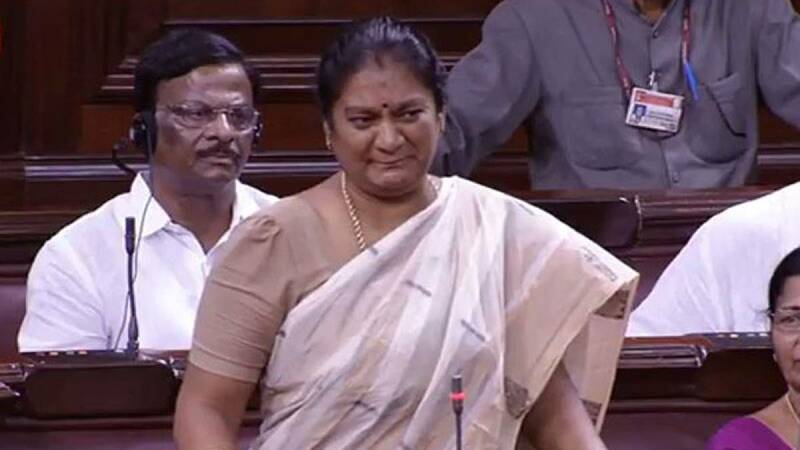 New Delhi : AIADMK on Monday sacked Sasikala Pushpa for allegedly destroying party's image by slapping DMK MP Tiruchi Siva. She pointed 'threat to her life' during monsoon session in Rajya Sabha, claiming she was being forced to quit her membership from the upper house. Deputy Chairman PJ Kurien gave permission to Sashikala Pushpa to speak up her mind in the well of the house. "There is a threat to my life. I am being pressured to resign from my Constitutional position. Sir, please help me," she said and broke down. • AIADMK member for Rajya Sabha Sasikala Pushpa has been sacked from her party for allegedly destroying image. • She alleged threat to her life amid pressure to quit her membership from the upper house of the Parliament. • "There is a threat to my life. I am being pressured to resign from my Constitutional position. Sir, please help me," Sasikala Pushpa said. • Deputy Chairman PJ Kurien asked her to write to the Rajya Sabha Chairman and Vice President, Hamid Ansari, about the alleged threat to her life and assured her the House's support. • Minutes after Jayalalithaa announced Sasikala has been removed for bringing bad name to the party. • Pushpa had been elected to the Rajya Sabha in 2014. At the time, she had been Mayor of Tamil Nadu's Thoothukudi.